When it comes to bizarre restaurant naming, seemingly haphazard and unrelated menu items, and ridiculous minimum credit card amounts, Greek places really have the market cornered. 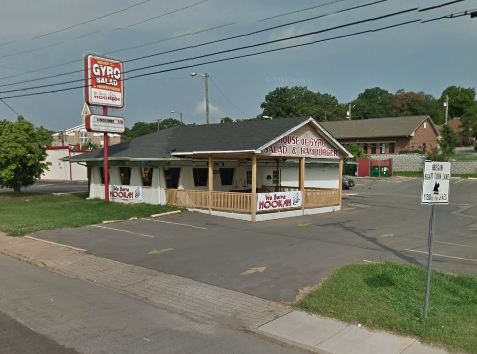 House of Gyro, Salad, and Hamburger in Hermitage, TN (just outside of Nashville) is no exception. When you have to refer to the AP Stylebook to figure out whether or not the Oxford comma belongs in your restaurant name, it is probably time to consider shortening the name. And I know that it is tempting to include menu items in your restaurant name, but let's leave it at just one item, sort of like the previous tenants of this building did (Pizza Hut, in case you were left confused here). "Hey Tony we have Coke products here, too. Should we call it 'House of Gyro, Salad, Hamburger, Coke, Diet Coke, Sprite, and Daily Rotating Specials (Generally Soups But Sometimes Dessert Items)' instead?" I will answer for Tony. No. No you should not. Because what happens when the box of Sprite syrup goes dry? Now you have to get a new sign. Shoulda thought that one through, Tony. And I don't know what it is, but every Greek restaurant seems to have a minimum credit card charge, assuming they take credit at all. I always feel like I am at a blackjack table when I see the "$10 MINIMUM" sign near the counter. I don't carry cash, on account of being completely broke, on account of being a blogger, on account of being bullied in middle school. Why do Greek restaurants have to discriminate against bloggers? Now I have to order at least $10 worth of food by myself (again, blogger) and get even fatter than I already am (yep, blogger). Thanks to Trevor, for sending this in and then quickly deciding what to order from the menu before even setting foot in the restaurant.